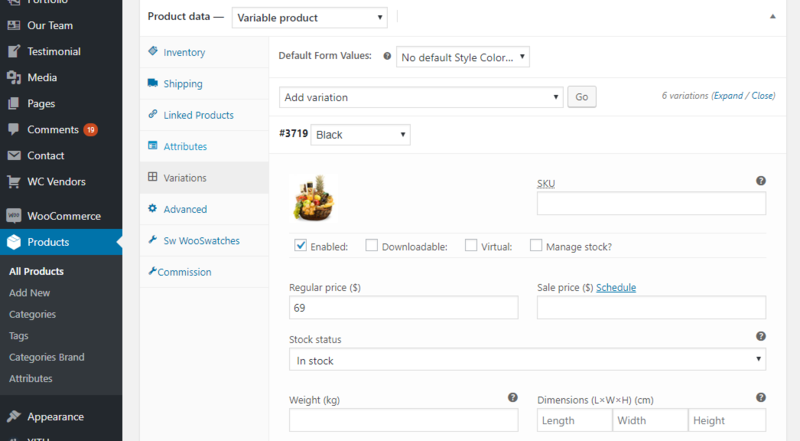 How to Add Color Swatch and Image in WooCommerce Products? Let’s learn how to use feature Color Swatch and Image in WordPress Themes! Firstly, a huge thanks for purchasing our themes. If you still had any problem with our theme, please feel free to contact us via our Support Ticket System then we will support you until you feel happy with our product! 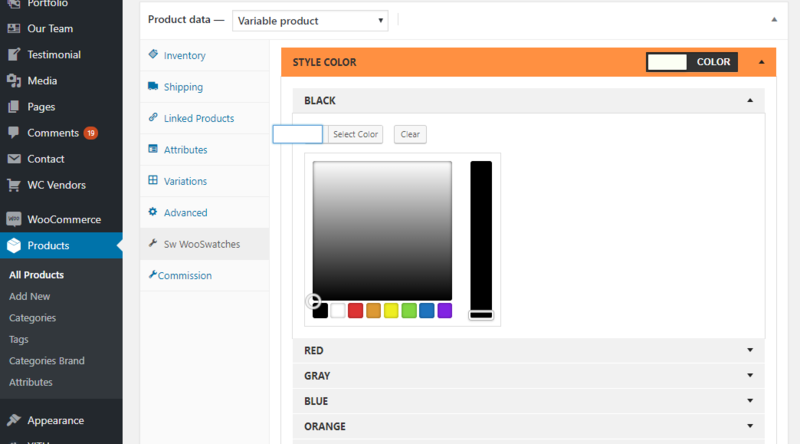 As you know, our themes support you with features color swatch and image for WooCommerce product. This is a great feature for an eCommerce site. Firstly, we need to install the plugin into your site. Please go to Plugins > Add New then upload the plugin into your site and Activate it. 3. Choose Enable Swatches Variation Listing parameter to enable swatches variation on the product listing page. 4. Choose Enable Tooltip parameter to enable image tooltip when you hover on image swatch on the single product page. 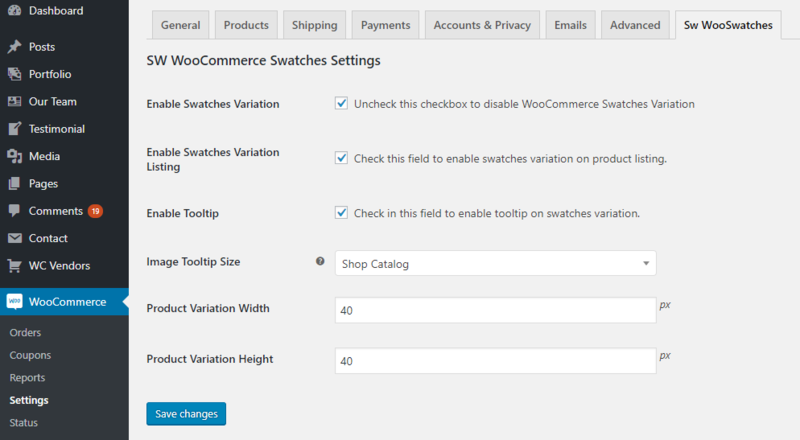 In SW WooCommerce Swatches, we can create and add the attribute in 02 ways: 01 – the available attribute in Products (can be applied for all variable product) and 02 – the custom attribute in a product (can be applied for the custom product). When creating the attribute in the Products tab, the attribute will be available for all products in your site. 1. To create a new attribute, please Go to Products > Attributes > then add a new attribute as you want. To configure the attribute, choose Configure terms of an attribute. 2. After that, you can create a term for the attribute. To edit a term, hover on the term you want and choose Edit to edit the term. When editing the term, you can add the Color and Thumbnail Variation for each term. Please note that if you do not add the color or thumbnail variation for the term, it will appear only text in the front end. If you only add the thumbnail variation, only the image will appear in the front end. 3. After all, you can add these attributes to your products. After choosing Product data as the Variable product, click on tab Attribute > choose the available value in box Custom product attribute as Color or Size then click Add button. Then you can configure the value for each term there. Finally, Click Save attribute and Update product and see it in the front end. For all custom product attribute, it will only be applied for a product. In this way, we need to create custom attribute > create variation > add product data. Click on tab Attributes > Click Add on box Custom product attribute then add Name, Values, choose option Used for variations and click on Save attributes button. After that, click on Publish product then the attribute will be updated in the product. Now, click on tab Viration > choose each attribute and upload image and complete other values of attributes. After all, click on Update product to update the variation to the product. Now, click on SW WooSwatches tab to add the color or images for each variation of attributes. After all, preview the product then click on Update button to publish it. Now you complete the task of creating a product with color and image swatches. How to Get Support from WPThemeGo Team? If there is any difficulty or question related to our themes, don’t hesitate to contact us to get support. FAQs: Go to Here to view more the Frequently Asked Questions.